The rules listed below serve only as general guidelines of staying safe and having fun in game. MyVMK reserves the right to refuse admission for any reason at the discretion of our staff members. Please remember that you are responsible for all actions on your computer/IP address. Breaking these rules will result in your access to MyVMK being revoked. Remember that if you see any of these rules being broken (or see anything else that isn’t appropriate for MyVMK), you can report the players in-game using the HELP button, or on the website using the Contact Us button on the navigation bar. 1. Do not bully, harass or threaten other players. This includes things like name calling. If someone asks you to stop talking to them, or to leave them alone, then leave them alone. Remember, if you are being bullied you can use the ignore button and you won’t be able to see them talking anymore. 2. Do not scam, or attempt to scam, other players. Scamming means misleading another player into giving you or someone else items, credits, or anything else of value using devious means. 3. Use common sense when trading. If something sounds too good to be true, it probably is. Trading is done at your own risk. When you click “accept” you are agreeing to the trade as it is shown. MyVMK will not be responsible for “bad trades”. This, however, does not include trades where you were not in control of your account at the time (provided the person gained access to your account without your permission). 4. Do not attempt to gain access to the accounts of other players without their permission. Remember however, if you do decide to share your login information with someone, you are doing this at your own risk. You, and you alone, are responsible for any actions on your account in these cases. You will be held responsible for all actions performed on your account. 5. Do not use any hacking, scripting, or cheating programs to interact with MyVMK. You can use unofficial programs to access the game as long as they don’t give an unfair advantage, so use your common sense. Using any unofficial applications to access MyVMK is done at your own risk. 6. Do not discuss, or mention, any inappropriate topics inside of the game including, but not limited to, discussions of sexual or drug related topics (including but not limited to alcohol). If you see this happening, be sure to report it immediately as there are minors on the game. Breaking this rule can result in your account being banned. 7. Do not break the law or encourage anyone else to break the law. If you are found to be doing so inside of MyVMK, we may report you to the authorities. 8. Do not share the personal information of other people (including non players) without consent. You may share your own personal information if you wish, but this is done so at your own risk. We hold no responsibility for anything that may happen as a result of this, and we cannot moderate based on anything that happens outside of MyVMK. 9. Any kind of hate speech, attacks, or general discrimination/intolerance against others will not be tolerated in MyVMK. This includes, but is not limited to, attacks based on race, religion, gender, sexual orientation, or political affiliation. Breaking this rule will result in your account being banned. 10. Discussion of trading MyVMK items (or anything else inside of MyVMK) for things outside of MyVMK, such as but not limited to, trading MyVMK items for money or Runescape Gold is strictly prohibited. If you decide to perform a trade like this, you are doing so are your own risk and we are unable to assist if you get scammed in such situations. 11. Impersonation of other users, or pretending to be staff on MyVMK is not allowed. 12. Using bad (swear) words or offensive language is not allowed in MyVMK. We have a chat filter to block out some (but not all) of these words, and attempting to bypass our chat filter, by any means (including but not limited to the use of abbreviations or changing the spelling of words) is not allowed. 13. Only use the Call for Help button when you really need to (i.e. no sending nonsense, or sending reports about the same issue over and over). Abuse of this feature could result in your account being banned. Our guide for reporting can be found below. 14. Use of alternative accounts (or “clones”) in order to gain an unfair advantage is not allowed in MyVMK. 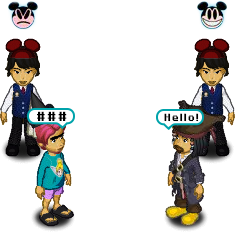 This includes, but is not limited to, using accounts to play minigames at the same time, ride Fantasyland Rides, attend HOST events, etc. You should not be able to gain anything you otherwise wouldn’t by using another account. 15. Abuse of bugs, glitches, or exploits in the game is not allowed. If you see anyone doing this, please report them as they can give players an unfair advantage over others. If you do encounter a bug or exploit, we would greatly appreciate it if you report it to us! There may be a reward for doing so. 16. Don’t evade bans. This means if you get banned, stay off of MyVMK until the ban is over, and don’t attempt to access it using another account. Remember, you are also responsible for anyone else's actions on your computer or internet connection, and using your account whilst someone else on your internet connection is banned may be considered ban evasion. We review this on a case by case basis. 17. Use common sense! Sometimes things may not be specifically mentioned in the rules, but are still not allowed or considered appropriate for the game. Use good judgement when doing anything in the game, and you’ll be fine. When anyone violates any of the rules above - if you don’t report it, our moderators do not know when these violations happen! When you are having a problem with the game, for example, you have disconnected during a HOST event, or one of your items seems to be missing. When you find a serious bug or exploit in the game (remember, serious means SERIOUS, if your hat is showing one pixel off center that doesn’t count). Any time you feel you genuinely need help from one of our staff members. The MyVMK staff are not the police, or trained therapists. We are unable to assist you with serious matters that occur outside of the game. If you are suffering from depression or suicidal thoughts, we strongly advise that you find a therapist to get the help you need. We may be able to provide you with resources if requested, but we cannot replace medical professionals. If you feel like you are in immediate danger, you can call 911 or your country's equivalent.